First settled just after the Civil War by a man called Colonel Cook, it's original name had been Cook's Schoolhouse. 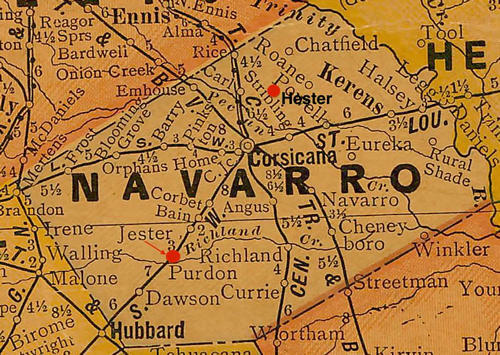 With the arrival of the railroad the town name was changed to Waters, Texas. Postmasters were not above hero worship and the American landscape is littered with place names of nearly forgotten celebrities, characters or relatives. The community produced enough children to require a school and in 1906, it had 57 students being taught by one exasperated teacher. The population reached its zenith in 1914 with a very respectable 300 residents. At the close of WWII, Corbet's population had been reduced by two-thirds. The 1970 Census reported just 80 people - the same was used through 2000. From Mr. Germann's email: "The name origins of a lot of Texas post offices are lost to the public, and oftentimes lost to history. But there's one fewer now. No one seemed to know the name origin. I had not come up with it when I did all of my research years ago, the Handbook of Texas was quiet on the subject, the websites dealing with Navarro County said nothing. I checked genealogical sites, cemetery transcriptions, census records, etc. 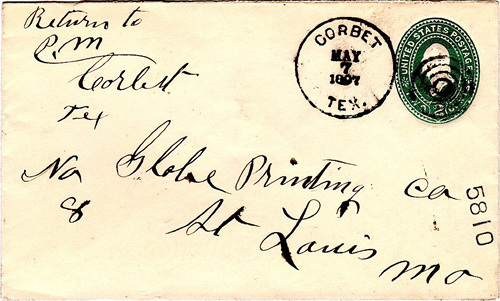 - looking for some Corbet family which might have lived in the area in 1893. All in complete vain. And, then, I found it - a quick mention on some obscure website. 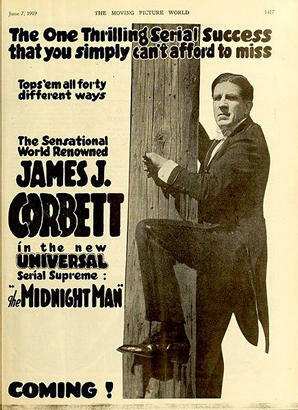 The notation suggested that the first postmaster named it for the legendary boxer, "Gentleman Jim Corbett." 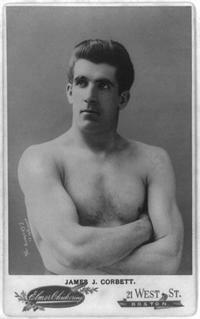 I checked up on that and, sure enough, in the previous year (1892) Corbett had beaten the even more legendary John L. Sullivan to win the heavyweight championship. Hallelujah! That's the kind of thing that makes research worth researching." Here he is shown impatiantly waiting for a train.